Download individual article PDFs by clicking their respective titles. 1. "Political Reforms VS. Undemocratic Institutional Arrangements in Hong Kong"
"This essay examines the recent political developments in Hong Kong. Specifically, it examines the problem of political accountability and unresponsive governance. The essay argues that lack of accountability is a byproduct of existing institutional arrangements – i.e. limited functional franchise, veto powers and institutional back doors – which promote rent-seeking behavior among tycoons and undermine the economic freedoms of ordinary Hongkongers, who, dissatisfied with the current state of affairs, demand political reforms." 2. "Transnational Ties: African Logistics Traders in Seoul"
"This study explores contemporary African migrants engaged in the informal sector of Seoul, the capital of South Korea. The adaptive strategies of African logistics traders are examined, together with how they mobilize and organize their business in Korea. Through their daily personal economic activities this migrant businessmen are contributing to the socioeconomic development of Korea and their home countries within the broader concept of globalization from below. 25 in-depth interviews were conducted between June to September 2016 with selected African traders in Seoul. The results from the study suggest that hard work, trust and good interpersonal networks are crucial to the success of these businesses. Recommendations are made regarding the extension of South Korea’s employment permit system to include selected African countries so as to reduce irregular migration." 3. "Could the KOPSI Hit 3,000? Reevaluating the 'Korea Discount' and Investor Learning and Unlearning in the Korean Market"
"The KOSPI index has hit an all-time high recently, pushing past the previous record set six long years ago. This has sent investor sentiment and economic soft data into highs unseen since the financial crisis, with analysts scrambling to revise their economic and stock market growth rates up. By various measures, the Korean stock market remains cheap and range-bound, especially over the past few years despite its strong market fundamentals and credit rating. With the benchmark index’s unprecedented start to the year, investor learning of “Boxpi” tendencies—which have all but been ingrained into Korean stock market investing 101— could be fading, and a vast array of positive news regarding market fundamentals and corporate governance reform in Korea could finally help resolve the “Korea discount” which has plagued the market for decades. All of this—and more—will be needed for the KOSPI to finally break the 3,000 level in the near future. Currently, it’s in the best shape to do so in what seems like a very long time." 4. "East Asian Regionalism: The Significance of Passive Integration and China-Japan-Korea (CJK) Trilateral Cooperation"
"The establishment of ASEAN in 1967 provided a new stage for Asian actors to interact with each other. With rapid economic growth, East Asia blossomed into one of the most critical regions in shaping the international economic order. The Asian Financial Crisis in 1997 proved that further regional cooperation was needed. The creation of APT was vital, and showed a strengthened Asian integration. However, the region has since stunted; regional schemes have not worked with efficacy. This dissertation aims to examine the core features of East Asian regionalism, and the importance of China-Japan-Korea (CJK) cooperation in forging a regional architecture. This examination is done by interpretative mode of analysis on a large spectrum of literature and a range of data from international institutions and think-tanks. The main findings are that, first, although there are rich regionalization activities present, regionalism via rigid mechanisms are lacking due to an array of factors. Second, CJK trilateral cooperation would foster development in regional cooperation. However, stringent political and security tensions must be solved. From this basis, the dissertation essentially argues that East Asian regionalism is driven by passive processes rather that proactive schemes, consequently CJK trilateral cooperation is significant in rejuvenating East Asian regionalism. 5. "Corporates' Role Beyond Corporate Social Responsibility – The Case of South Korea"
"An effective public diplomacy requires a strategic, symmetrical communications program with well-networked stakeholders. These stakeholders- individuals, NGOs or multinational corporations play an important role in legitimizing and building credibility to the state’s public diplomacy policies. They also provide an expertise in their field to improve the effectiveness to a strategic public. When targeting a specific type of public, Multinational Enterprises (MNEs) show strength in this field because marketing itself is targeted to a selected group of customers. Thus, it is not surprising to see a well-networked collaboration with the government and the corporations in public diplomacy. In recent years, Korea’s efforts to improve its country image and its diverse programs have been associated with diverse actors, including Korean MNEs. Research finds that many of these efforts have been humanitarian programs as a part of their Corporate Social Responsibility (CSR) program. This paper examines what is corporate diplomacy and analyzes what makes an effective corporate public diplomacy, with its challenges. It first begins with highlighting the importance of collaborative public diplomacy and that it requires a ‘strategic stakeholder engagement’. By introducing corporates as effective actors for public diplomacy, this research examines roles and capacities of MNEs in public diplomacy. This paper will apply the case of Korea looking at the successful cases and challenges of the Korean corporate public diplomacy. This paper will conclude in providing a more expansive role for the MNEs in public diplomacy, in which exceeds further than CSR activities. MNEs have become essential actors in public diplomacy and it is necessary to incorporate them as effectively as possible." 6. "A Study on the Implications of the Renegotiation of the Service and Investment Chapters of the Korea-China FTA Through a Case Analysis of the Financial Services Chapter of the Korea-US FTA"
"China’s recent retaliation to the deployment of the Terminal High Altitude Area Defense system (THAAD) in the Korean peninsula has keenly targeted the Korean service sector. Problematically, however, the profundity of the service sector provisions of the Korea-China Free Trade Agreement (FTA) is neither deep nor intricate. The Korean government is aware of such vulnerability. However, China is yet considerably conservative in regards to the liberalization of its financial service market as demonstrated in their consistent implementation of a positive list approach mechanism to the Financial Service Chapter in all of its previous FTAs. On the other hand, the Korea-US FTA is comparatively liberal in terms of market access due to its negative list approach mechanism, which renders it a suitable framework for appropriation of certain provisions in its renegotiation of the Korea-China FTA Service Sector Chapter. In particular, there are five key provisions under the Financial Services Chapter of the Korea-US FTA that ought to be borrowed in the adoption of the Korea-China FTA. This paper analyzes the legitimacy and reasoning of why Korea and China should utilize the following provisions as a template for its renegotiations of Financial Services sector of the Korea-China FTA. 7. 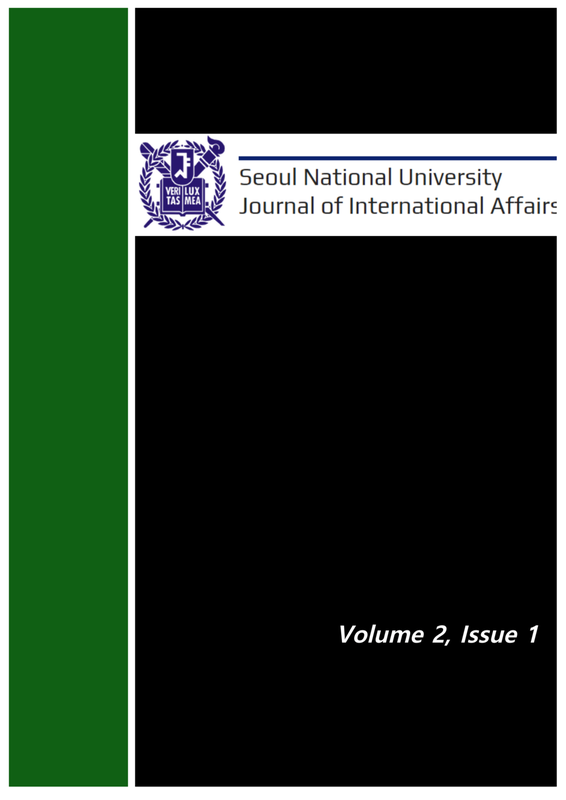 "South Korea and the Public Diplomacy-International Development Nexus"
"This paper uses theories of the public diplomacy – international development nexus to analyse how South Korea uses international development aid as a tool of its public diplomacy. As an OECD-DAC member, it has rapidly increased the outreach of its development aid to many developing countries, which often regard South Korea’s development experience as an example of a successful development model. In this way, the paper shows how development can be considered as a niche of South Korea’s middle power diplomacy. The paper explains how South Korea blends its foreign aid and development policies with public diplomacy in two ways. First, through projects, such as Korea Aid, South Korea uses development aid as a facet within which it enacts its public diplomacy initiatives. Second, as South Korea is a recent graduate to the OECD-DAC club, its experience of South-South cooperation allows it to act as a bridge-maker, and rule-maker, between different paradigms of development within the global development community." 8. "The Responsible Water Hegemon? Chinese Transboundary River Agreement with Kazakhstan and Russia and its Implications for Future Sino-Indian Water Relations"
"Recent Chinese hydroelectric power projects on the Sino-Indian-Bhutan Transboundary River, Yarlung Zangbo or Brahmaputra River, continue to receive skeptical backlash from Indian media and academics. Indian and American security analysts argue that China’s internal water security problem will force the country to use the Himalayan River to their advantage, which could spark regional conflict. Chinese scholars have not shared similar concerns. The purpose of the essay is to understand the nature of Chinese water practice and the possibility of a Sino-Indian Transboundary Water Agreement. By scrutinizing the development of Sino-Russian and Sino-Kazakh Transboundary River Agreements, the essay will argue that Chinese transboundary river agreements are a reactive result of long-term lobbying conducted by neighboring countries. The main argument is theoretically supported when observing recent development of Sino-Indian cooperation regarding the Yarlung Zangbo or Brahmaputra River. However, continuing disputes of the status of South Tibet or Arunachal Pradesh will significantly affect and delay the process of future water cooperation between the two Asian powerhouses."